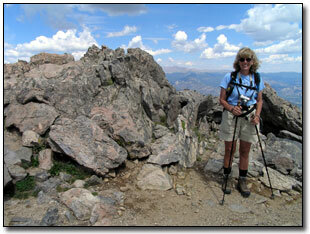 More and more people today enjoy the simple, wholesome fun of hiking. hiking is an affordable, yet healthy and emotionally rewarding way to spend a vacation or a long weekend... and you don't need to visit a travel agent. Experienced hikers will always tell you that every detail matters when you pack hiking gear, especially tents and camping stoves. The right hiking accessories and clothing, a properly and ergonomically packed backpack, positive mood and good fitness; all these elements play an equally important role in the success of any hiking trip. Hiking boots are the most important part of your hiking gear. The right footwear will serve you longer and take you farther and safer than any training shoes or sneakers will. You can wear a cheaper pair of pants or an old t-shirt, but a good reliable pair of hiking shoes or boots should be as expensive as you can afford. Many people consider their jackets as another important clothing item for a hiker, especially in the colder periods of the year. A hiking jacket can be a true lifesaver if you choose well. A Gore-Tex top layer will shield you from cold, wet, and windy weather. Many hiking jacket manufacturers use a layering approach in their jackets, so that an outer shell layer becomes not insulation, but goes over insulating clothing. Underneath a Gore-Tex layer your can wear a lightweight and even trendy fleece jacket, which you can use in warmer months and for other sporting activities too. Light weight towels should also one of your accessories hiking tents are a must if you plan to camp in mountain regions in all three hiking seasons - spring, summer, and fall. hiking tents can be used for protection from storms, winds, small animals and insects. Along with a tent pack a sleeping bag and an insulating ground pad which also brings warmth as well as ironing out bumpy ground. A lightweight, dependable back packing stove is much easier to use than campfires which are often prohibited in certain areas. A camping stove manufactured by such trustworthy brands as Primus and Coleman are basically a fuel container and a fire faucet with burner grates. These grates can collapse for compact storage. More expensive models even have electronic ignition so you won't need matches or lighter. Although it is always a good idea to pack matches anyway in case of ignition failure. Another version of a camping stove is a storm cooker which basically consists of a spirit burner with windshield and handle and a pot or pan for cooking. These stoves are lightweight because you don't need a propane container, but are sufficient for one or two people only. The newest models of camping stoves are environmentally friendly, odor-free, and very accommodating. To cook and eat take a pot, spoon, and a cup. To start the camping stove, if you don't have an ignition feature, lighters are more reliable than matches. Take more fuel than you initially planned as camping stoves "eat" more fuel in cold weather.